Welcome to West Cornwall Fencing. 25 years on and still going strong! We are a family run business and we’ve been around for over 25 years. Our proprietor Gary Beazley is an apprentice served builder with decades of experience. West Cornwall Fencing. Varied use of wood and colour. In 1989 he decided to specialise in quality domestic, commercial and industrial fencing. In the 25 years since, he has built a credible reputation in this field. Gary is the go to person for any fencing need in West Cornwall. He is not a gardener who does fencing but a skilful and trusted fencer who does fencing. Gary personally overseas every fencing project to guarantee customer satisfaction. At West Cornwall Fencing we can install a new fence to your exact specifications. And, should the fence you really want not be available from stock we can quickly make it for you (at no extra cost) in our workshop located on the outskirts of Penzance. 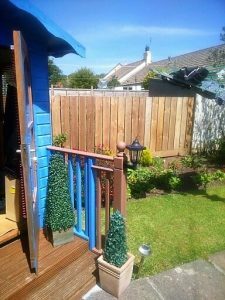 At West Cornwall Fencing we pride ourselves in our reputation for high quality installations and outstanding customer service. Rest assured, all our fencing is done on the basis that we must proud enough to show it off if it is in our own garden or on our own premises. Over the 25 years we have been running we have invested in the best tools available. As a result we can work efficiently which means we get the job done with the minimum of disruption and fuss. It also means a quicker site tidy up for us when we complete any project. For your piece of mind, all our work comes with a sensible guarantee. Our attention to detail in everything we do means that most of our work comes from personal recommendation. However, over the years times have changed and as a result, we have decided set up a web site. We hope you like it! At WCF we hate waste because we care about the environment. Therefore, we get our timber from sustainable sources wherever possible. Rest assured, we always make best use of the materials we buy so nothing new is wasted. We recycle off-cuts to make bird nesting boxes and flower tubs. These become goodwill gifts or donations to local charities. The Team at West Cornwall Fencing is happy to work in an area that covers: Penzance, St Just, Hayle, St Ives, Marazion, Goldsithney, Helston, Camborne and all points in between. Consequently, you will see us hard at work anywhere within the Penwith area plus parts of Kerrier. For all other options, please navigate via the menu at the top. Remember that we honour all our quotes. Once accepted we guarantee that you will not pay a penny over the quoted amount. The poor chaps had to work in awful weather ... but even though they took a couple of days longer to do the job, they stuck to their original quote. How many tradesmen do that these days? Brilliant! I confess that I didn't really know what sort of fence I wanted when I called West Cornwall Fencing. All I knew that my old fence which had been blown down in a gale needed replacing with something better. Gary visited (on time) and talked me through the options. What really impressed me was that there was no hard sell. I was listened to and then given a range of options/prices to choose from. P.S. the new fence is looking great! Copyright © 2019 West Cornwall Fencing. Powered by WordPress. Theme: Spacious by ThemeGrill.